Front doors make an undeniable first impression. 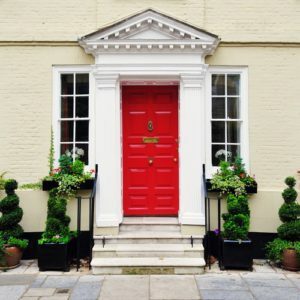 Whether it’s a cheerful yellow, an on-trend purple or a welcoming red, the color of your front door can have a major impact on how your home is perceived. If you’re ready to take your front door from drab to fab, here are some guidelines to help you choose the perfect hue. If you’re unsure where to start when choosing a color, look to the style of your home. The architectural elements and personality of your house can help dictate what colors will look best. Also take into account construction materials and surrounding landscape. For example, a Mediterranean style home would look fabulous with a blue front door, but a black door may seem out of place. Just like understanding the character of your home, you should also consider your own personal style when choosing a paint color. Are you traditional or trendy? Bold or subdued? Playful or orderly? Your home is ultimately a reflection of the people who live within it, so don’t be afraid to let your front door have a little personality. Now that you’ve studied your home and considered the impact you want to make, it’s time to choose a color. Understanding what each color conveys can help make that decision much easier. Orange – Orange is a great color that conveys a variety of messages, since it is both cheerful and earthy. Purple – Purple can be an overwhelming color when used in excess, but it’s the perfect statement color for a small space like a front door. It also pairs well with nearly all the exterior colors. Yellow – There’s no denying that yellow is associated with cheerfulness, happiness and warmth. Choose yellow if you want to set an inviting and energetic tone. Red – A popular color for a front door, red is confident, passionate and sophisticated. If you’re worried red is too bright, choose a darker, more subdued shade. Green – Green is fresh and pairs well with the surrounding landscape. It also signals that this is the house to watch for style and design inspiration. Black – Choosing black as a front door color shows that you are bold and confident. This dramatic color can lend a feeling of elegance. Blue – Feeling a bit different? Then try painting your front door a shade of blue. Blue is memorable and unique, and creates a calm and dreamy vibe. In addition to the color, you should also pay attention to the kind of paint you choose. Glossy finishes work best on most exterior doors, as they hold up well to nicks and scrapes. However, keep in mind that high-gloss paint should be avoided on older doors with imperfections, as this finish will make those problems more noticeable. Make sure to choose exterior paint, and use a coat of primer for the best results. Also be sure that you stay consistent with using latex or oil-based paints.